The great Isaac Newton had said once that “ To myself, I am only a child playing on the beach, while vast oceans of truth lie undiscovered before me. ” How true! A quiet day on a beach, where there is nothing to do, is according to me the best vacation for anyone. I love beaches. Whenever a new travel plan is being discussed in my family, my first choice is always for visiting a beach in some or other country. It is always my dream to relax on the white sands and watch the azure bluish sea, roaring continuously, and face the cool salty breeze blowing through my hair. Over the years, I have been fortunate enough to visit some of the most picturesque beaches of the world. These may not be the world's top beaches necessarily, yet I have found them extremely beautiful. I always remember and cherish my little sojourns at these beaches. My love affair with beaches of the world, began many years ago, when I was visiting west coat town of Weston-Super- mare in England. I was staying then with a relative of mine, who had a nice house on a little hillock like terrain, north of the main town. My relative insisted that I must visit the beach and took me there. It was evening and the sun was about to set. In front of me a scene was unfolding, which was stunning and now permanently etched in my memory. The vast beach, the long pier or jetty going deep into the gulf like a dagger, at the end of which, there was an enclosed construction housing restaurants and museums, made that place extremely picturesque. Traveling south east of England and leaving the Spanish coast to venture into Mediterranean sea, another set of fabulously lovely beaches comes up on the Balearic Islands Archipelago. The largest island from this archipelago is undoubtedly the amazing Mojorca island, which has some of the most spectacular beaches with sparkling white sand, pretty inlets, turquoise sea and natural landscape . Majorca has more than 120 beaches, yet some are very popular. Magaluf beach is only 8 Kms from the capital of the island Palma. This is a large beach with a good selection of hotels, restaurants, shops, disco and bars. From Balearic islands let us fly to west again, crossing England, Atlantic ocean and the North American continent on the way to California coast. Almost every visitor to California visits the picturesque 17 mile drive near the town of Monterey. South of this drive, there is a lovely beach known as Carmel beach. A nice road known as Ocean avenue branches of from highway No. 1 and takes you to the pretty town of Carmel with its beautiful main street decorated with flowers and rows of little curios and coffee shops. This road ends straight on the beach with smooth silver sands and azure looking Pacific Ocean stretching in front of you. The sea looks very quiet and tame here, but it is so because of the Carmel bay. A day at Carmel is certainly very relaxing. For visiting the next beach, which is on my favourite list, we need to fly across Pacific and land on the Malay peninsula. 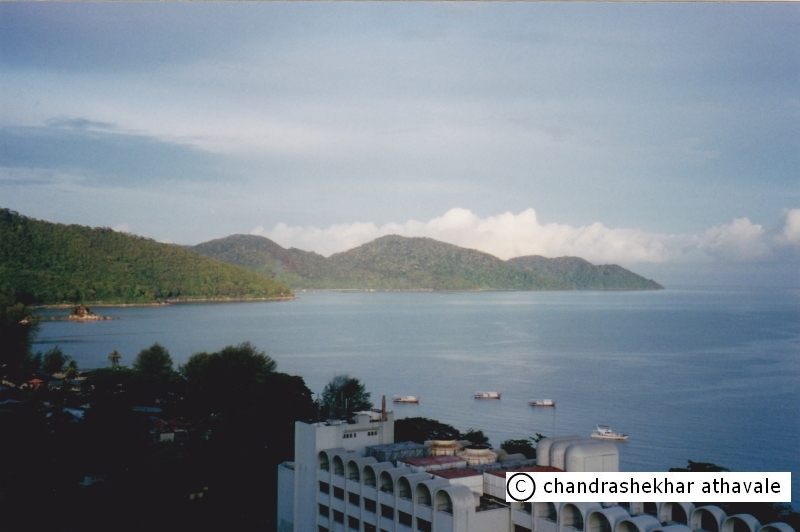 Island city of Penang, is located on the west coast of this peninsula and has one of world's best beach (at least according to me) and is known as Ferringhi Beach. In the local Malay language, Ferringhi means a foreigner. The beach has acquired this name perhaps, because of the presence of large number of foreigners on this beach. This 'L' shaped beach is very long and ends with few rocks projecting into the sea at one end. Just behind the beach, emerald green hills rise majestically. The white sands with traces of red, blue sea and the backdrop of green hills here, create a mesmerizing effect on you. I have enjoyed this beach for two consecutive days and the experience has been memorable. Another beach, which I love because it is so unusual, is further down south. To visit this beach we must travel to island of Bali. On Bali island, there are more than hundred beaches. 'Kuta' beach being one of the very famous. I however found 'Kuta' very crowded. To the south end of Bali island, there is a beach and a shore line named as Nyang Nyang Beach. 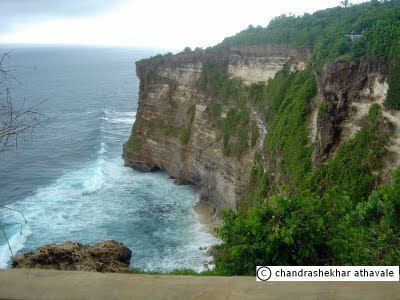 This beach is down belowr the famous cliff hanger 'Ulwatu' temple and can be seen from there. I just adore this beach. This beach is the only place in Bali, where you can face Indian ocean instead of Bali sea.. This beach is ideal for surfers. 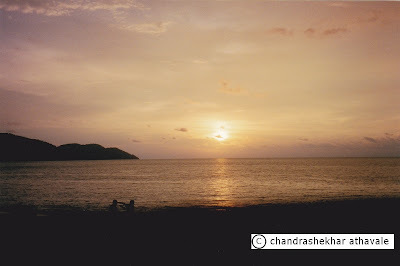 Back home in India, lovely beaches of Goa are all time favourites. 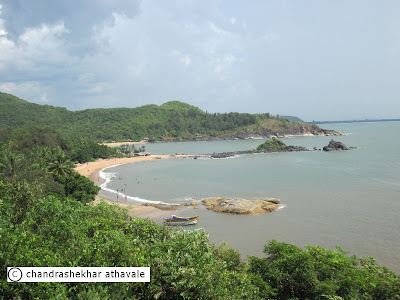 Yet, I prefer a beach down south near to a town, known as 'Gokarna Mahabaleshwar.' 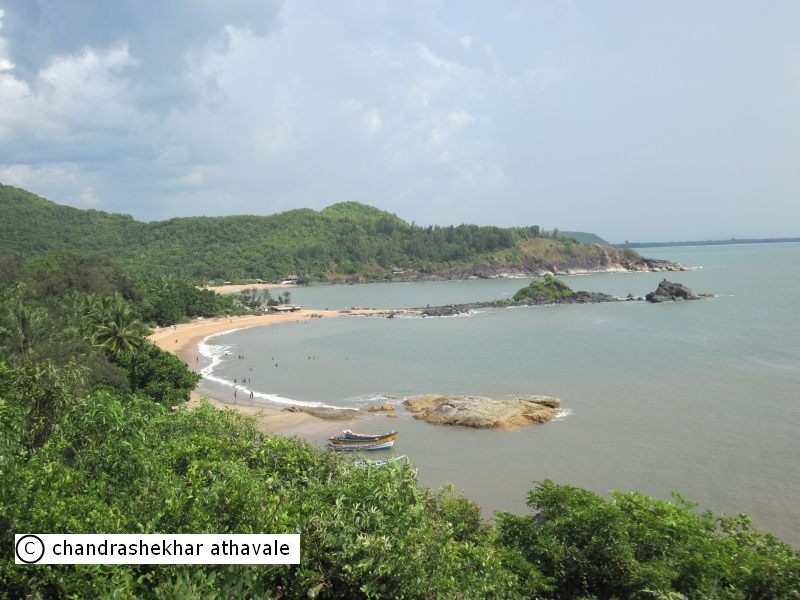 This beach, shaped in the form of a Devnagari script alphabet 'Om' is one of the superb natural beauty spot. Interspaced with black coloured rocks projecting in Sea and the palms swaying in the wind, this beach is stunningly beautiful. I could just go on and on. But these are really some of my top favourites. May be in future, I would write about few more beaches from India and abroad, which I love.